The latest issue of the Arctic Studies Center Newsletter, published by the Smithsonian National Museum of Natural History, features an article written by program alum Molly Gleeson (’08) on a project she did during her 3rd year internship at NMNH’s Anthropology Conservation Lab. In the article Molly discusses the treatment of a Yup’ik ground squirrel parka which is part of the exhibit Living Our Cultures, Sharing Our Heritage: The First Peoples of Alaska opening at the Anchorage Museum in May 2010. Also make sure to check out the rest of the newsletter for more articles on the work the conservators are doing in preparing about 600 Alaska Native objects for their return to Alaska for exhibition and future study. Categories: Uncategorized | Tags: Alaska, Anchorage Museum, Arctic Studies Center, exhibit, internship, Living Our Cultures, Molly Gleeson, National Museum of Natural History, NMNH, parka, Smithsonian, squirrel, UCLA/Getty Program, Yup'ik | Permalink. 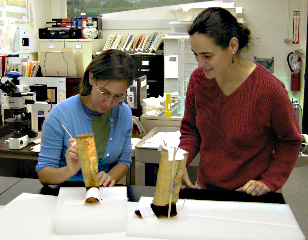 For the first part of her third year internship, Lauren Horelick (’10) is working at the Alaska State Museums under the supervision of conservator Ellen Carrlee. Lauren will be carrying out treatments of several objects in addition to helping to develop an Alaskan Fur Id project, the aim of which is to aid in the characterization of various furs seen in Alaskan cultural objects. One of the objects Lauren has treated, a pair of Aleut/Alutiiq child’s knee boots, was featured as the Sheldon Jackson Museum’s artifact of the month. The boots, reportedly made from sea lion esophagus and sealskin, underwent examination and treatment that involved adhesive testing, cleaning, humidification, tear mending and loss compensation. To learn more about the boots, you can read the museum’s press release. Categories: Uncategorized | Tags: adhesive testing, Alaska State Museums, Aleut, Alutiiq, boots, conservation, Ellen Carrlee, humidification, internship, Lauren Horelick, loss compensation, sea lion esophogus, sealskin, Sheldon Jackson Museum, tear mending | Permalink.